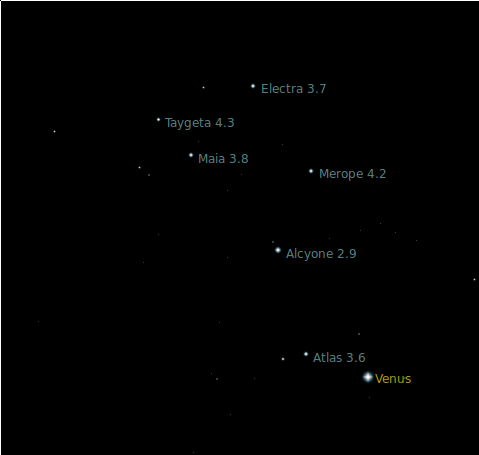 Tonight Venus passes directly between Earth and an elusive cluster of stars known as the Pleiades. Once every eight years, a luminous Venus passes directly between Earth and an elusive cluster of stars known as the Pleiades. Tonight, you’ll have a chance to witness this event with your own eyes. The photo up top was taken a few days ago on the evening of March 31st, and showcases the two astronomical entities that you’ll be looking for. Obvious-as-ever is Venus, the brightest object in the night sky save for the Moon, beaming on the right. Less dazzling, but conspicuous in its own right, is the cluster of blue stars gathered on the left. These are the Pleiades. Also known as Messier object 45 (M45) or the "Seven Sisters," the young star cluster is thought to have formed less than 100 million years ago, which helps explain the blue-white hue of its largest members. At just 400 light years away, the Pleiades are still visible with the naked eye, but they’re usually easier to spot with a pair of binoculars or a small telescope. 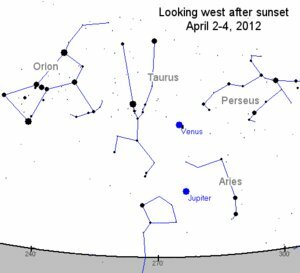 Tonight, however, you should be able to spot them due to their proximity to Venus. According to NASA, the planet will join the Pleiades in the night sky beginning just after sunset, making it "look like a supernova has gone off inside the cluster." Jupiter and Venus near the moon today! !